The Marvellous Spatuletail (Loddigesia mirabilis) is one of the world's rarest hummingbirds that only occurs in the remote Utcubamba Valley in northern Peru. 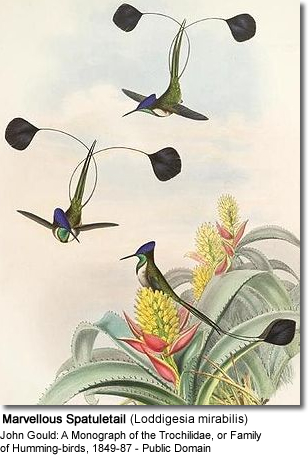 This hummingbird was first reported in 1835 by the bird collector Andrew Matthews who worked for George Loddiges. He collected the skin of a male that became the basis for John Gould's famous monograph featuring this bird -- a portion of which artwork is shown at right. The Marvellous Spatuletail is endangered within its limited range (110 km2) due to deforestation on the mountain slopes of the Cordillera del Colán. Locals also capture males specifically for their attractive tail feathers and for food -- as their dried hearts are said to have aphrodisiac properties. Additionally, one of the childrens' established games is to shoot hummingbirds down with catapults. The American Bird Conservancy joined together with their Peruvian conservation partner ECOAN to protect and manage about 100 acres (0.40 km2) of significant habitat for the Marvelous Spatuletail hummingbird. To this end, they planted over 30,000 native trees and bushes that specifically meet the needs of the Marvellous Spatuletail. This so-called conservation easement is the first of its kind in Peru. They also work together to develop a sustainable eco-tourism program. Several organizations are currently working in partnership to conduct an education program, survey additional sites and raise funds for land acquisition in the La Florida region. As tourism is growing in this area, efforts to preserve this species are intensifying amongst the locals. For example, Mr. Montenegro - formerly a potato farmer - is now growing plants that specifically attract around 30 bird species and children are being discouraged from harming hummingbirds. The Marvellous Spatuletail is restricted to the eastern slopes of the Rio Utcubamba Valley (an affluent on the right bank of the río Marañón) in the Cordillera del Colán, Amazonas, and one site in San Martîn, northern Peru at an elevation of 7000 ft (2100-2900m) (Birdlife International 2000). On the slopes above the río Utcubamba, it has been found north and south-east of Leimebamba, the Chachapoyas area and the town of Florida, on the shore of Lago Pomacochas. In recent history, the only place where this hummingbird can be found is near Florida, where it occurs in low densities and may only be seasonally present. Its numbers are continuing to decline (Birdlife International 2000). There is an isolated record of a male having been seen near Jesús del Monte, San Martín, in 1987. Other unconfirmed records placed this bird near Tingo, Utcubamba and Leimebamba. Those ornithologists who were able to locate this species agreed with Ted Parker's observations in the 1970s and 1980s that full-tailed males were outnumbered by females and immatures by a ratio of more than 5 to 1 (Hecht 2001). This may be explained by the fact, that the males are hunted and killed for the perceived aphrodisiac properties of their hearts and their long tails. This shy Spatuletail is typically found along the forest edge and isolated woodlots on steep slopes. They favor the thorny, impenetrable Rubus thickets admixed with Alnus trees. 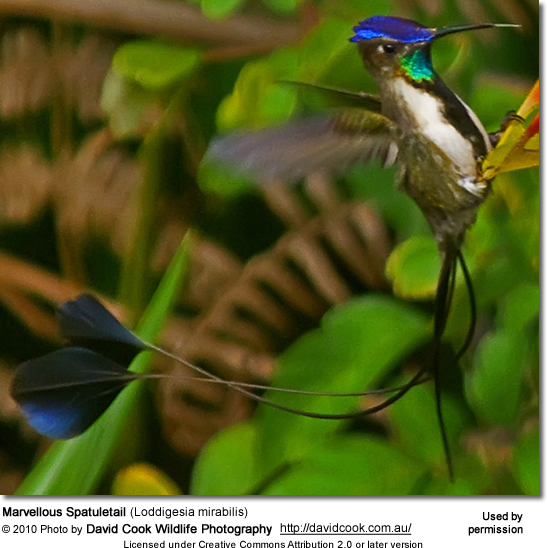 The Marvellous Spatuletail is a medium-sized hummngtbird that averages 10 - 15 cm in length (including its tail). The body itself is very small --it has been described as being "about the size of a slightly fluffy ping-pong ball." Its beak is about the size of a matchstick. The plumage is mostly white and green below and bronzy-brown above. The male has blue crest feathers on top of his head, a brilliant turquoise gorget (throat patch), and a black line down the center of the otherwise white chest and abdomen. The sides of the chest and abdomen are green. He has only four long feathers in its tail, two of which are long racquet-shaped outer tail feathers that cross each other and end in large violet-blue discs or "spatules". The male can move these feathers independently. These tail feathers grow to three or four times the bird's body length, although the tail varies with age. The female's tail is much shorter with drop-shaped rackets. She has a white throat and lacks the colorful throat patch and black line that can be seen in the male. Juveniles lack the spatules of the adults. 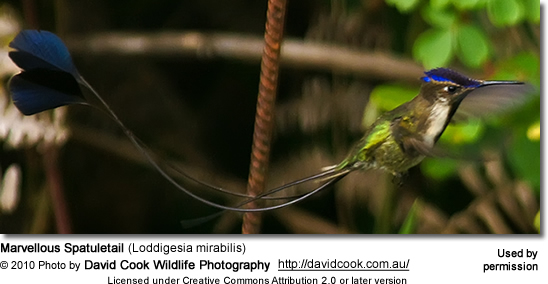 Similar Species: The Booted Racket-tail is much greener with rounded head. The breeding season typically commences in late October and goes on until early May (Birdlife International 2000). Males use their spatules (= flat disks at the end of their tails) to display at leks to females (leks are gatherings of males for the purposes of competitive mating display). During this mating display, the males make snapping sounds - which originally was thought to be generated by their long spatule disks clapping together. However, it was found that even though the spatules wobble very closely together, the noise was actually coming from its mouth. During this display, the males will dance with a twig at super high speed, hopping over and over, backwards and forwards, across the twig mid-air. He is described to do so about 14 times in 7 seconds. As part of this display, the male hovers in front of the female while furiously waving his spatules about. The female is responsible for building the cup-shaped nest out of plant fibers woven together and green moss on the outside for camouflage in a protected location in a shrub, bush or tree. She lines the nest with soft plant fibers, animal hair and feather down, and strengthens the structure with spider webbing and other sticky material, giving it an elastic quality to allow it to stretch to double its size as the chicks grow and need more room. The nest is typically found on a low, thin horizontal branch. The Marvellous Spatuletails primarily feed on nectar taken from a variety of brightly colored, scented small flowers of trees, herbs, shrubs and epiphytes. They particularly seek out the red-flowered lily Alstroemeria (Bomarea) formosissima as well as flowers of the "mupa mupa" trees. They use their long, extendible, straw-like tongues to retrieve the nectar while hovering with their tails cocked upward as they are licking at the nectar up to 13 times per second. Sometimes they may be seen hanging on the flower while feeding. At their feeding plants, this fairly small species is dominated by more aggressive birds, such as sylphs, train-bearers, and violetears (Hecht 2001). They make peculiar humming and loud flapping noises.